Aussie superstar DJ and dance/pop dynamo Havana Brown continues to eke out a successful DJing and recording career, with a string of hit singles, club favourites and Billboard Club chart number ones now under her belt. She’s also the creative force behind one of the country’s biggest selling dance music compilations, ‘Crave’. Havana recently made a trip home from her new base in Los Angeles to chat about her new single ‘Like Lightning’, so we caught up for a quick natter and began by asking her whether she found the City Of Angels an inspiring, creative place to be. “I feel very comfortable, because everyone is in the industry and you can be exactly who you are,” she explains. “You can be slightly weird and it’s not weird over there. It’s not looked down upon or frowned upon. I can wear my band t-shirts as a dress and no-one looks twice, you know what I mean? And being surrounded by other creative people, songwriters and producers means that Havana has the chance to consistently keep her finger on the pulse when it comes to what’s new, new trends and new styles in music. When she’s not in LA, she’s travelling across the US (and the rest of the world), working the decks at different parties and increasing her visibility in the hope of cracking the US market; a notoriously difficult task. “It’s not easy. It’s much bigger and very different to Australia,” Havana explains. “With every state, there are about four or five different radio stations and you can be getting played really regularly on the east coast, but not getting played at all on the west coast. And you kind of need everyone to be playing a song at the same time for it to ride up the charts. We express surprise that the sun-kissed shores of the West Coast of America wouldn’t be among the first to embrace new music. “Well because it was a dance record, I thought it would be coming out in London before the US, but the US picked it up straight away and loved it,” she says. “I was just grateful that it was doing well. We ask Havana, given she’s spent so much time in the US now, how she reckons Australian media could better support Australian artists. “I don’t want to complain about that. I think if you make good music, Australians are going to support it,” she replies. “I do agree that we appreciate the international acts and it could be due to the fact that there’s just a lot more money going into those acts. The US has a lot more money because it’s a bigger market and so when something blows up, it blows up internationally. “But I think as Australian artists, we’ve just got to aim to be on the international scale of things and for the music not to just be sounding like just an Australian song, but an international song. We have the opportunity now. This is the best time to be in music, because we can go global and it’s much easier TO go global. We mention to Havana that we’d love the federal government to legislate that Aussie radio stations have to play a minimum 30% Aussie content on a per hour basis, so they’re not able to fulfill their Australian music commitments by shoving it all into a show late at night. “I would like that, yes,” she exclaims. “Triple J is meant to be for Australians, but then they don’t play a lot of Australian pop. It’s paid for by the Australian taxpayer and they play a lot of great Australian music on there, but they do not play pop. Speaking of “the pop side of things”, Havana recently released a new track called ‘Like Lightning’. Her first single release in 16 months, the track was co-penned by US pop superstar Kesha, UK singer John Newman’s brother James and superstar pop songwriter Stuart Crichton as part of a songwriting retreat in Bali. “Who’s LOVELY by the way,” we interject. “He is. He’s amazing,” she continues. “And also James Newman, who’s done a lot of the John Newman stuff. I’m in good company here. “As soon as I came out of the jungle from ‘I’m A Celebrity, Get Me Out Of Here’, I heard this track and I loved it straight away and I was told by my manager that Kesha wanted me to do it. Really wanted me to do it. So I said, ‘she doesn’t have to want me to do it… I want to do it!’. “Kesha and I have worked with similar people in the past. She’s worked with the Squared Division boys and they’re good friends of mine. Or I’ve been playing in the same city when she’s been there or we’ve been at the same clubs. So though we’d never really hung out prior, we knew of each other. She knows what I’m about and who I am. Brooklyn-based rapper Dawin, who hit the top ten with his smash single ‘Dessert’ last year, features in a guest role. “Once I’d recorded it, worked on the production with Stuart and gotten it to a point where I was really happy with it, I was listening to it and thought it would be nice to have a feature just to break it up and add a little bit extra to it. “I reached out to Dawin (who’s a label buddy), I loved his track ‘Dessert’ and I knew that he produced and wrote all his own stuff and he’s incredibly talented. So I asked him to do something on it, he heard the track and said ‘yes’ straight away. We mention to Havana that ‘Like Lightning’ is a lot more pop-leaning than some her previous more club-based offerings. But she tells us she wants to be an artist not boxed in by peoples’ perceptions and expectations. “I do not just want to do just one type of sound,” she tells us. “I want to be able to change with the times. And so I’m going to keep trying. I love pop and I feel it’s going a bit more R&B and hip hop. Even a little while ago with ’Better Not Said’, I had a little bit of a hip hop vibe with the drop; going a bit more trap rather than going such a full EDM/dance drop. “So that’s my aim… I want to be able to be accepted more generally. And that’s a lot of freedom there. I know I’m pushing the love, maybe, by changing things so much, but I just want people who love me to embrace that. You can’t expect the same old thing every single time. I want to take risks. I want to be fearless. I want to think, ‘this is a great track, I love it, I want to put it out’. And in further good news for Havana fans, she reveals she’s working on an album. “Yes, absolutely. I’m working on music. I’m always writing. I can’t tell you when it’s going to happen, but hopefully it’s not too far away,” she reveals. And of another edition of her ever-popular ‘Crave’ compilation series? 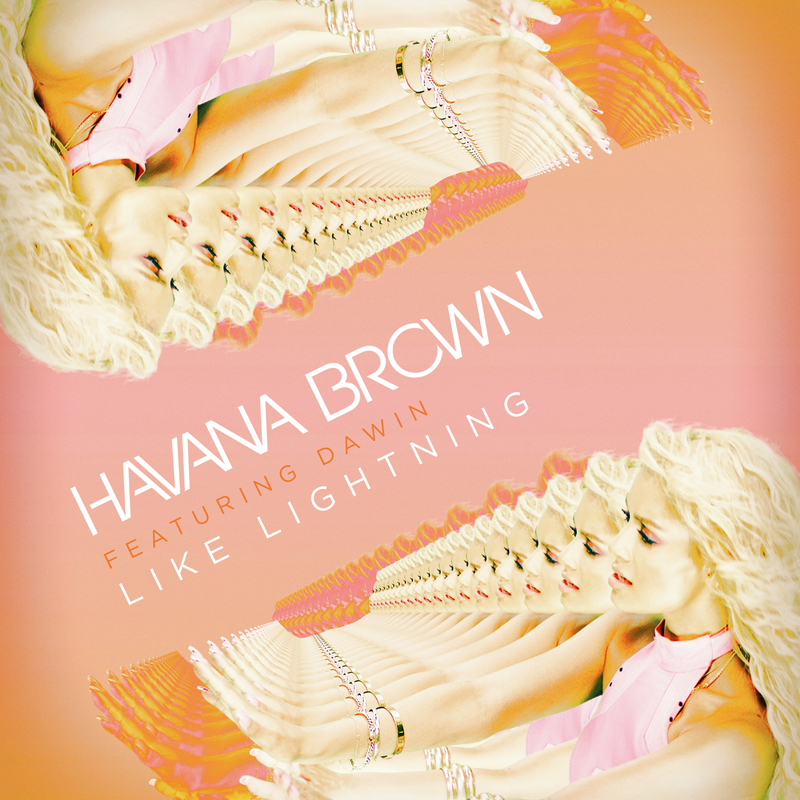 Havana Brown’s single ‘Like Lightning’ is available digitally now.